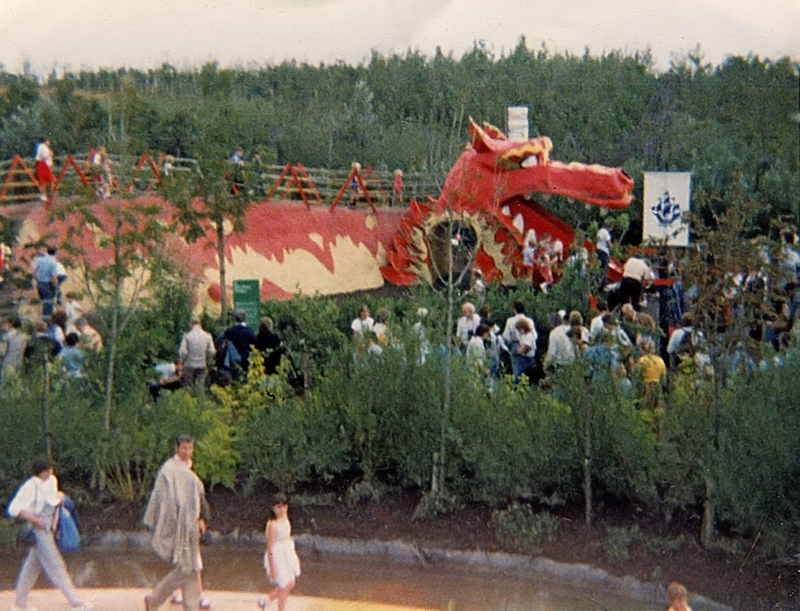 Dragon Slide at The International Garden Festival in the Summer of 1984, Liverpool, England. Ever had that feeling where you wish someone at the time had taken photos? Imagine the Victorian wealth of knowledge we’d have if even more people had hopped on the photography bandwagon! And sometimes, don’t you wish you’d taken more photos? This local history lark, perhaps without me realising it, has become centred around collecting fresh memories now so that future-me can rest assured that someone did take photos and someone did write it down. For that reason I really enjoyed Gerry’s post on his blog That’s How the Light Gets In, called ‘Liverpool 1984: looking back’. It was a crucial time in Liverpool’s history: the Toxteth riots were recent history, and the Militant Tendency were on the rise. With the benefit of hindsight it’s easy to see this time as a tumultuous period before the gradual and hard-won development of Merseyside into the cultural and business centre that it is today. I try to avoid the danger of viewing history from this privileged point of view – one where everything looks inevitable. In 1984 Liverpool’s prospects were far from rosy, whether or not you knew of some people’s plans for the place. Gerry’s blog post is a create cross-section of cultural Liverpool from that year. He takes in politics, the International Garden Festival, Liverpool Football Club’s successes on the European stage and music, in the form of Probe Records (and Pete Burns legendary cantankerousness!). There are photos too, of all this plus pre-redevelopment Clayton Square, theatre posters and street scenes. If you could distil what makes Liverpool so… Liverpool, then 1984 seemed to have it all: political and social upheaval, and popular culture which hit international heights. ‘Liverpool 1984: looking back’ is a perfect time capsule of a fascinating period, and one I (at an extremely young age) lived through. Read it: Liverpool 1984: looking back, is on the That’s How the Light Gets In blog.